That’s right, they’re back. 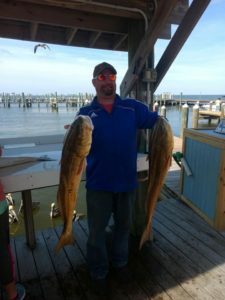 Redfish in Gulf Shores and Fort Morgan! This is what we are known for down at the west end of the Fort Morgan Peninsula; BIG REDFISH. 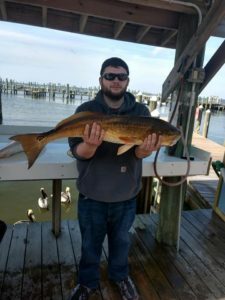 It’s early April as I write this, and we’ve finally gotten back into catching some really nice redfish in Gulf Shores. The excitement of hooking a big red, a bull red, is hard to top. The rod bends, and our backs bow too. Redfish pull really hard. They don’t run fast or far, but they give a good fight before you can land them in the boat. 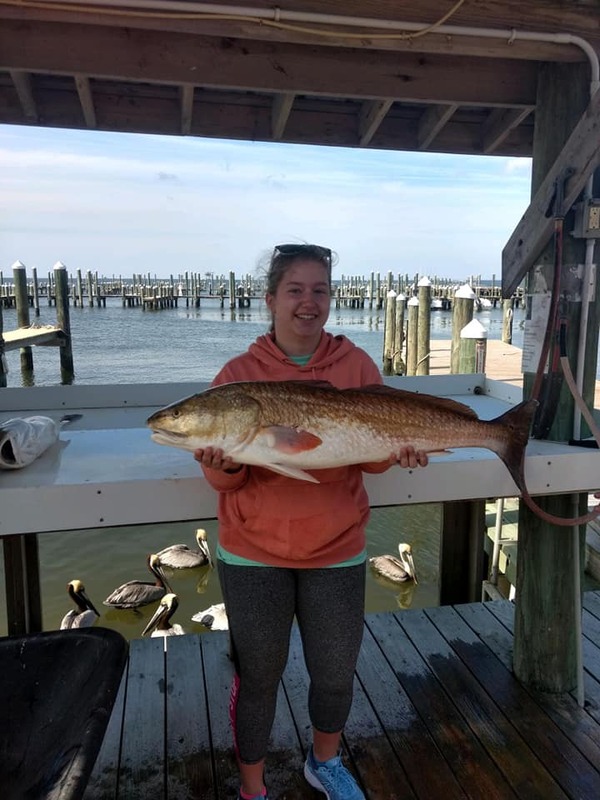 Often measuring close to 3 feet and weighing over 20 pounds, redfish are a favorite for fishing charters around Gulf Shores. No one forgets their first bull red. One of my favorite things about being a fishing guide is putting families on fish and seeing the excitement of both the youngsters and the adults as a kid pulls in a redfish almost as big as they are. I usually have to remind the adults to let the little ones do it their selves. The sense of pride showing in their ear-to-ear smile. Why Are The Redfish in Gulf Shores so Big? One of our go to spots for redfish in Gulf Shores is Dixey Bar. Dixey Bar, yes that is spelled correctly, lies just south of Fort Morgan and east of the Mobile Ship Channel. Sand pushed westward by the longshore current is effectively dammed by the strong flow of water moving out of Mobile Bay. It is here were wave action, and water flows in multiple direction toss around small bait fish. The redfish gather here and gorge. The redfish will get into a feeding frenzy where they will bite the right kinds of bait when presented in the right way. That’s where I come in. After more than 50 years of fishing this area I know what kind of bait catches the most fish at different times of the day and different times of the year. What redfish gobble up in the springtime, might not get a nibble in the fall. I look to make every fishing trip an enjoyable experience for the entire family. I’m patient with the anglers and older ones too. I appreciate that you choose me to guide you on this journey and take my responsibility very seriously. We’re going to have fun while being safe. So be sure to give me a call at 1-251-213-6680 to plan your trip. I’ll give you the few details you need to know before you show up at the dock, ready to go. Check out our Dolphin Cruises. Only 1 1/2 hours, perfect for little ones. What about being able to see jellyfish, stingrays, squids, crabs and shrimp up close. Captain Joe will even tell you where to touch them. Check out our fascinating Sea Creature Trawling trip. When you go home with your redfish, give this recipe a try.